Few contemporary industrial acts are spoken of in such highly reverential terms as Alberich, the solo project of underground super-producer Kris Lapke. While Lapke himself may best be known for his production and mastering work, both for such diverse sounding acts like Prurient, Nothing, and the Haxan Cloak to his audio restoration work for COUM Transmissions and Shizuka, Alberich has achieved a cult on par with many of the legends he works with; Lapke's diverse contributions as a producer are recognizable for the perfect balance of maximalist and minimalist electronics that Alberich has relentlessly authored. Since Alberich's 2010 masterful and highly collectable two-and-a-half hour NATO-Uniformen album (HOS 421LP), he has become a powerful force of modern industrial music. With only a series of limited tape and split releases, fans have been waiting with bated breath for a true follow-up album. 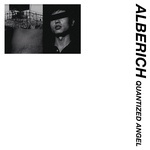 Quantized Angel is Alberich's first full-length album in almost a decade. In the intervening years between albums, Alberich has grown more nuanced, creating atmosphere and tension on par with Silent Servant's classic Negative Fascination LP (2012) in regards to production and attention to detail. The results create a newly polished but no less intense vision of modern industrial music. Over the course of the album's eight tracks, Alberich demonstrates a vision of ruthless existential electronics, a sound both commanding yet questioning in introspective spirit. Features exclusive track contributed to Berghain 09 2x12" mixed by Vatican Shadow on Ostgut Ton. LP version. Includes large format poster. Few contemporary industrial acts are spoken of in such highly reverential terms as Alberich, the solo project of underground super-producer Kris Lapke. While Lapke himself may best be known for his production and mastering work, both for such diverse sounding acts like Prurient, Nothing, and the Haxan Cloak to his audio restoration work for COUM Transmissions and Shizuka, Alberich has achieved a cult on par with many of the legends he works with; Lapke's diverse contributions as a producer are recognizable for the perfect balance of maximalist and minimalist electronics that Alberich has relentlessly authored. Since Alberich's 2010 masterful and highly collectable two-and-a-half hour NATO-Uniformen album (HOS 421LP), he has become a powerful force of modern industrial music. With only a series of limited tape and split releases, fans have been waiting with bated breath for a true follow-up album. Quantized Angel is Alberich's first full-length album in almost a decade. 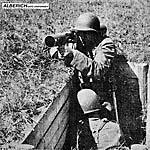 In the intervening years between albums, Alberich has grown more nuanced, creating atmosphere and tension on par with Silent Servant's classic Negative Fascination LP (2012) in regards to production and attention to detail. The results create a newly polished but no less intense vision of modern industrial music. Over the course of the album's eight tracks, Alberich demonstrates a vision of ruthless existential electronics, a sound both commanding yet questioning in introspective spirit. Features exclusive track contributed to Berghain 09 2x12" mixed by Vatican Shadow on Ostgut Ton. This gatefold double LP set is a redacted version of Alberich's indomitable, spirit-crushing opus, NATO-Uniformen, cut from 30 tracks in the original eight-cassette box (limited to 50 copies) to 19 tracks on this version, edited in 2014 for the Trans Industrial Assembly in NYC. Originally deployed in 2010, its bombed-out luster has become a firm favorite of everyone from Blackest Ever Black's Kiran Sande to Endangered Species' Vereker. Between the bludgeoned doom techno of "Skysweeper," the shell-strewn darkwave scenes of "Man Is Ready" and the Carpenter-esque adrenalizer, "Immortality Is No Consolation for Death," Alberich finds a very specific line through heavy electronics, synth zones, and dread techno, and holds it to the last with a shell-shocked, eviscerated aesthetic most unlike any other. Fully remastered and cut at Alchemy.